Last month I wrote a piece about Sky’s announcement that they were planning to limit the number of adverts that betting companies could show on their network during commercial breaks to one. Despite the fact it was due to cost the company around £200 million in television sales, it appears as if the decision from the television behemoth has inspired some of the country’s biggest gambling companies to follow suit and voluntarily choose not to show their adverts during sports matches. The decision has been taken by the Remote Gambling Association, which has members including Paddy Power, Bet365 and Ladbrokes. Whilst Sky’s decision to limit the number of betting adverts that can be shown on its airways during commercial breaks to one will have helped the companies with their decision, it does come on the back of sustained political pressure from all major parties. Indeed, the Labour Party has committed to curbing the influence of betting firms if it wins the next general election. The specific details of what the self-imposed ban will involve haven’t yet been outlined, if for no other reason than it needs to be ratified by the Industry Group for Responsible Gambling. That is likely to be little more than a formality, given pretty much everyone involved in the gambling industry acknowledges that changes need to be made with the way that they operate. Many believe that the ratification from the IGRG will either come before the end of December or early on in 2019. 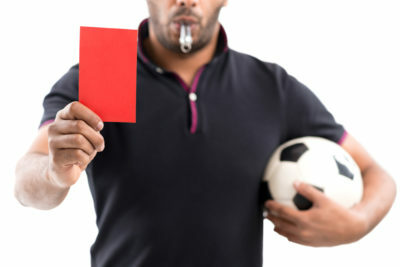 What I can tell you for the moment, however, is that it’ being referred to as a ‘whistle-to-whistle’ ban, with the idea being that no betting adverts from companies within the RGA will be shown between the start and end of sports matches. In all likelihood, though, the ban will stretch out to before kick-off and after the full-time whistle. 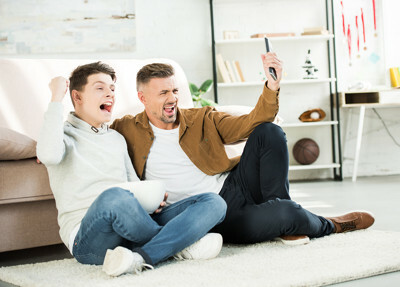 It’s more than likely that there will be no betting adverts shown during the entire broadcast of a sports match, which will obviously hit companies like Sky Sports and BT Sport the hardest. The ban will include games that kick-off before 9pm, which is the watershed, but finish after that point, which many are somewhat surprised by. In fact, the only sport that is exempt from it is horse racing. It was felt by most concerned that the horse racing industry is just too reliant on gambling for it to be practical for the ban to be in place during horse racing meetings. Such is the extent that horse racing uses gambling money to sustain itself that many feel it could do the sport irreparable damage. It will be in place for all other major sports, however, with football the most likely to be affected. Whilst betting companies will likely still chose to show adverts during non-live television events, such as documentaries and catch-up shows, the limit will hit both them and the television companies quite hard. The important thing, though, is that it will offer important relief to those problem gamblers that currently see the adverts as an encouragement to place bets. Though every sport has its share of links to betting, there’s no question that football remains the biggest sport for gambling companies. 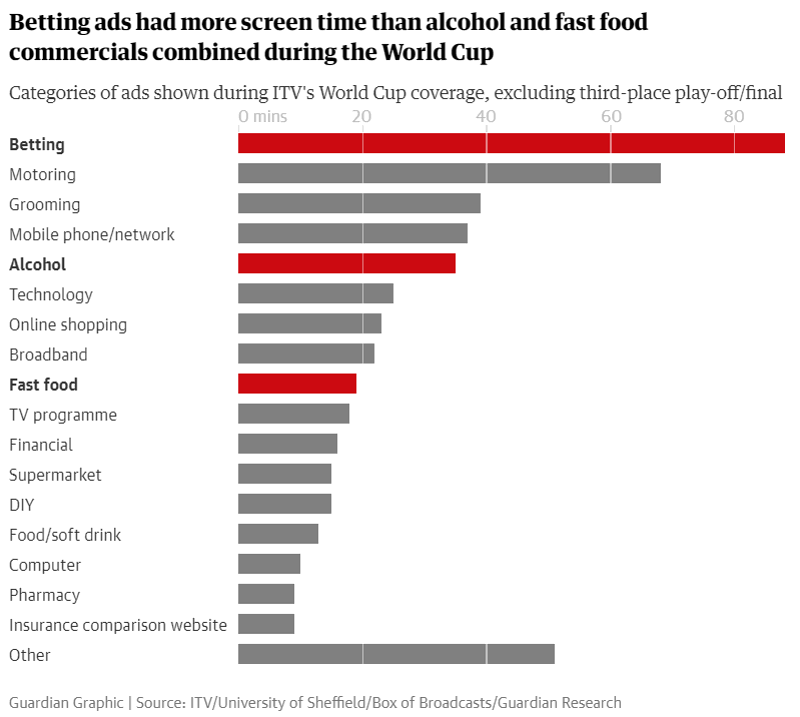 During the World Cup in 2018, for example, more than ninety minutes of betting adverts were shown. When you consider that the BBC covered half of the matches and doesn’t show adverts, that means an awful lot of betting adverts were being shown predominantly on one channel. That’s the sort of thing that can contribute to the issues of the 430,000 plus people that the Gambling Commission believes can be described as ‘problem gamblers’. It’s also felt that the sheer number of adverts on TV ‘normalises’ gambling as a pastime and fuels the problem of under-age betting. That’s why the likes of Labour’s Deputy Leader Tom Watson is ‘delighted’ by the decision, whilst the Secretary of State for Digital, Culture, Media and Sport, Jeremy Wright, has described it as a ‘welcome move’. Tom Watson has been one of the driving forces behind Labour’s criticism of the gambling industry, so it’s no surprise that he described himself as ‘delighted’ at the news. He’s previously said that the situation has reached ‘crisis levels’ and so has commended the Remote Gambling Association for ‘taking its responsibilities seriously’ and listening to the public that he felt ‘supported’ the curbing of the industry’s influence. 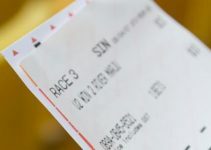 That feeling was mirrored by Sarah Hanratty, the Chief Executive of the industry’s own responsible gambling body the Senet Group, who said that gambling messages around live sport had become ‘unsustainable’. One of the most interesting things about the desire to curb the influence of gambling companies is that it’s not a one-party issue, instead gaining support from both sides of the aisle. Conservative minister Jeremy Wright said that he was ‘pleased’ that the sector was ‘stepping up’ to self-monitor. He said, “It is vital children and vulnerable people are protected from the threat of gambling related harm. Companies must be socially responsible”. That was backed up by the spokesperson for Fairer Gambling, Matt Zarb-Cousin, who said, “It is long overdue, there has been a huge amount of pressure on the sector over the volume of advertising which has increased exponentially year on year”. For many people, the natural question is around whether or not it will actually make any real difference. After all, aren’t people who gamble going to place a bet regardless of whether or not they see an advert encouraging them to do so? The Chief Executive of GambleAware, Marc Etches, believes it’s about much more than just the placing of bets. He believes that curbing the ‘normalisation’ of gambling in the eyes of younger people could be crucial. Whilst the ever-ever-expanding use of technology and the influence of the internet might still be rather novel to older people, those that are a bit younger are growing up with it and see it as something ‘ever-present’. The result of that ever-present nature of the internet, according to Etches, combined with the normalisation of gambling as a hobby through adverts means that younger people don’t separate gambling from other areas of their lives. This can be seen in the fact that one in eight eleven to sixteen-year-olds actually use social media to follow gambling companies, which Etches describes as ‘concerning’. He said, “While we welcome this move by betting companies, it is important to pay attention to analysis that shows the marketing spend online is five times the amount spent on television”. In other words, it will definitely make a difference but there’s still more to be done. Could Football Sponsorship be Next? In terms of purely speaking about the decision to limit gambling adverts, the RGA will be waiting to hear from the Industry Group for Responsible Gambling before implementing their changes, but it does seem as though it will happen pretty much immediately once they’ve ratified it. 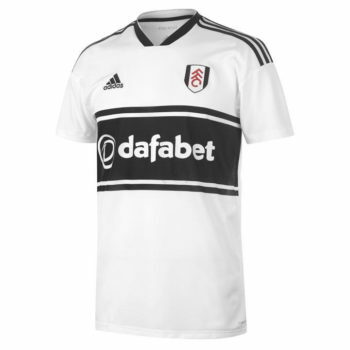 In the more long-term, many are wondering whether or not football clubs will begin to move away from getting their shirts sponsored by gambling companies. As I’ve already said, football is the biggest sport for betting companies in terms of money spent by punters, but it’s also one of the biggest benefactors in terms of sponsorship money from betting companies. At the time of writing, around 60% of clubs in the top two divisions in England, the Premier League and the Champions League, have shirt sponsorship deals with betting companies. That’s what has led Zarb-Cousin from Fairer Gambling to say that if the gambling industry wants to make a real difference then it should also include both ‘shirt and league sponsorship’ and also ‘digital advertising around the pitch’. He said, “If the whistle-to-whistle TV advertising ban is justified then the other things are as well. I think it is worth bearing in mind that it is the broadcasters that have been most resistant to the clampdown on advertising”. Zarb-Cousin is also somewhat skeptical that the decision from the Remote Gambling Association, which will also include companies like SkyBet, Gala Coral and Betfair, is entirely down to their own sense of what’s right and wrong. Speaking to the BBC he said, “I think the writing is on the wall. If they hadn’t done this, the government would have acted anyway, perhaps next year. There is no legislation in the pipeline but the strength of feeling cross-party and in both houses suggests that it is unsustainable”.